Open Factory by Tatonka - "Unique in the outdoor industry!" Take a look behind the scenes at Tatonka's production site. 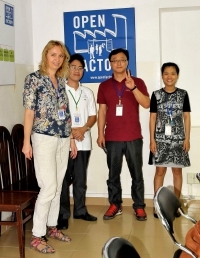 As one of only a very few companies in the outdoor industry, the German family company TATONKA supports and runs its own production facilities, Mountech Co. Ltd. in Ho Chi Minh City, Vietnam. 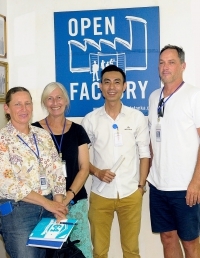 Both couples visit Open Factory on 19th August 2016. Elisa Martin visits Open Factory on 22th July 2016. Chairman of the SPD Bundestag Thomas Oppermann visits Mountech with a german delegation on 2nd March 2016. On Friday, January 15th, 2016 Reinhard Cardinal Marx, archbishop of Munich and Freising and chairman of the German Episcopal Conference visited Tatonka’s Open Factory together with a delegation of ten. In the Tatonka plant Mountech Co. Ltd. located in Vietnam the SA8000 compliance is currently due to be revised after three years. Together with other well-known outdoor gear companies in Germany Tatonka faces its product responsibility to a particularly high degree. Once again in 2012 the Christian Initiative Romero put well-known outdoor gear companies to the test. 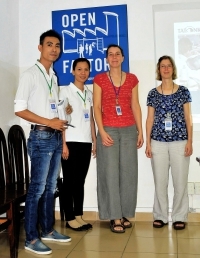 In April 2012 a group of Japanese journalists visited the TATONKA production plant Mountech Co. Ltd. in Ho Chi Minh City. 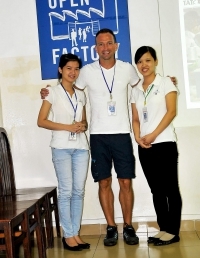 TATONKA takes over social responsibility for its employees and is rewarded. The Bavarian outdoor brand TATONKA welcomes the first visitors to its production plant Mountech in Vietnam.